In South India, many temples have Salabhanjika, a stone sculpture in the shape of a woman holding a lamp that is set in place as a sacred guard to the deity. 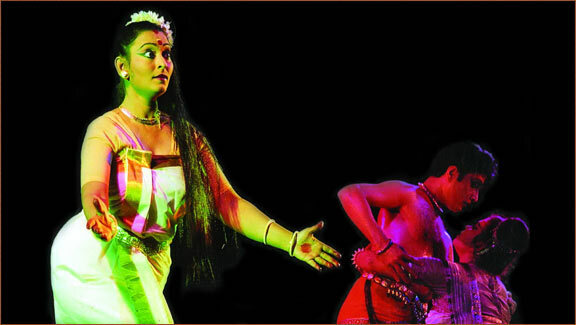 The Salabhanjika in this choreography is no ordinary stone. It has the essence of Ahalya in it. Ahalya, a character from the Hindu epic, Ramayana,was turned into a stone by the curse of her husband and freed by Rama.In the dance piece a sculptor works tirelessly on the stone in which Ahalya has been lying dormant. The sculpture imparts all the grace of the feminine ideal creating a captivating Salabhanjika that has a split personality. Salabhanjika yearns for union with the sculptor and dreams of happiness however ephemeral it might be. Ahalya, the bereaved spirit, feels shades of pain and awaits for salvation that, Rama will bring — a contrast of worldly desire and spiritual divinity.